Medullary cystic disease (MCD). Contrast-enhanced CT in a 35-year-old man with MCD. Multiple cysts are seen in the medullary area. Two daughters were also found to be affected. 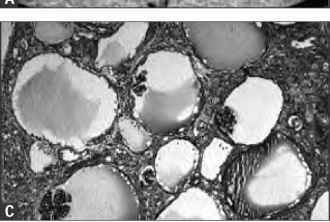 MCD is a very rare autosomal-dominant disorder characterized by medullary cysts detectable by certain imaging techniques (preferably computed tomography) and progressive renal impairment leading to endstage disease between 20 and 40 years of age. Dominant inheritance and early detection of kidney cysts distinguish MCD from autosomal-recessive nephronophthisis (see Fig. 9-48), even though the two may be indistinguishable on histologic examination.